Please enter your measurements and select "Get Calculations" to fill in the missing values. The first step is to verify that the glass size meets our tempering furnace requirements which has a maximum bed size of 141" x 82" or minimum of 31" x 20". 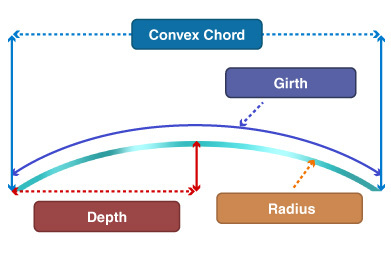 The convex chord, or width, is the distance between two endpoints of the curve. Your measurement is recommended to be taken on the outside of the glass. 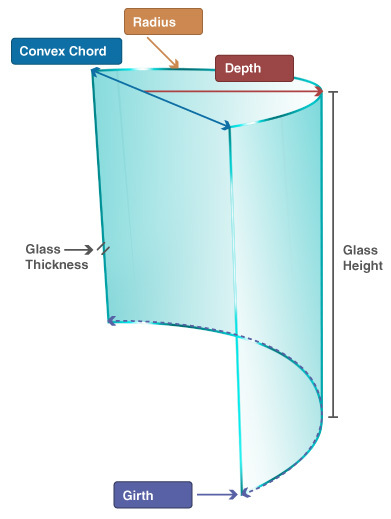 This is typically the first measurement required and entered in the bent glass calculator. To determine the radius of the curve you will need to measure the depth next. This is done by measuring the outer top of the curve and taking half the measurement of the convex chord as illustrated to the right. Enter your chord and depth measurements in our glass calculator and it will calculate your final radius (in inches). This will also provide us with the girth measurement which determines the total distance around the bent piece of glass. Max Glass Size: 141" x 82"
Min Glass Size: 31" x 20"
1/4" Glass Min Radius: 63"
3/8" Glass Min Radius: 70"
1/2" Glass Min Radius: 78"
3/4" Glass Min Radius: 98"